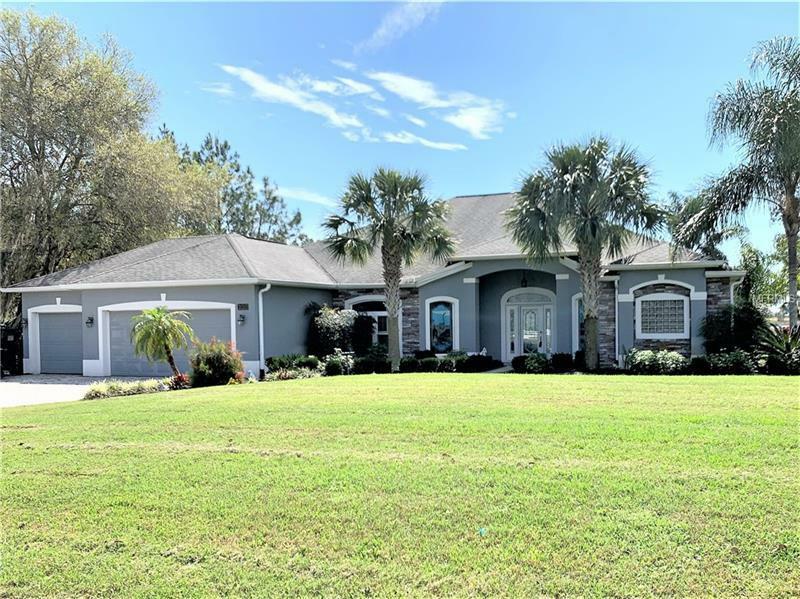 Stunning waterfront custom pool home w/large fenced yard on 1.29 acres on a Wetland Bird Sanctuary in Arrowtree Reserve! Exuding excellence, this 2700+ square foot gem is better than new with all of the timeless/updated finishes, pristine cleanliness, and loaded custom features. The fully pavered extended driveway entrance sets the stage for the top-quality finishes inside. Lead glass front door, stained glass windows, plantation shutters, updated double pane windows, & disappearing sliding glass door leading to the lanai are just a few of the delightful details. The expansive open floor plan upon entry invites the eyes to take in the great room, formal dining room, open kitchen, and dinette area. Beautiful mahogany floors and ceiling fans flank the space with richness and depth of beauty. The abundant kitchen is the heart of the home & boasts custom wood cabinetry with pull out shelving, granite counter tops, & stainless appliances. The extended master suite boasts a dedicated sitting room/office area with bay window & gorgeous views of the Wetland Bird Sanctuary and lake, & direct access to the pool & lanai areas. The spa-inspired master bath features a separate soaking tub & enormous walk-in shower. This popular SPLIT PLAN designed home boasts a guest suite/in-law quarters w/sitting room, & private bath. The sprawling lanai is your private oasis, enjoying the Florida Outdoor Lifestyle of sunning, swimming, relaxing, and bird watching. PLEASE NOTE:Flood insurance IS NOT REQUIRED by the seller's lender.